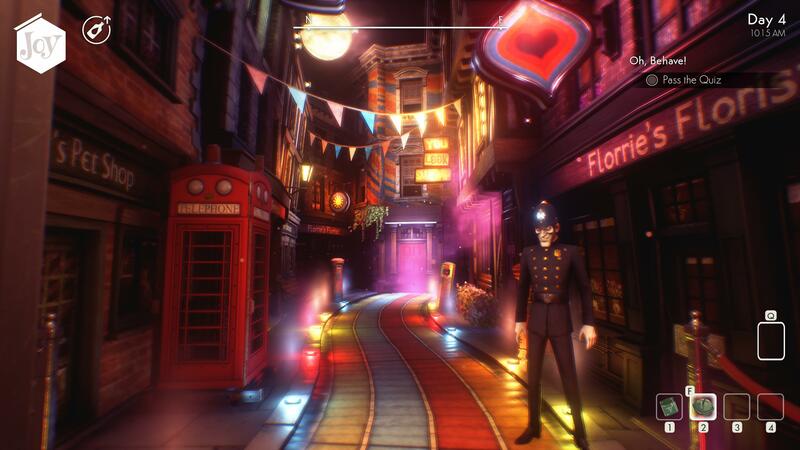 We Happy Few has an enormous amount of ambition, a game that sets out to join the pantheon of sneak-based grandchildren of Looking Glass, but in a more open world. And while it keeps looking like it’s going to deliver, it really serves to demonstrate just how astonishingly good the games on whose shoulders it wobbles really are.What I think I routinely fail to appreciate, when revelling in the utter pleasure of games like Thief, Prey and Dishonoured, is just how sublimely well they work. Putting aside the entertainment, the mechanics, and the writing, they’re also games that are exquisitely refined, every detail functioning with precision. It’s the sort of thing that in a great game, you absolutely shouldn’t be appreciating, because it all facilitates getting on with having a great time. 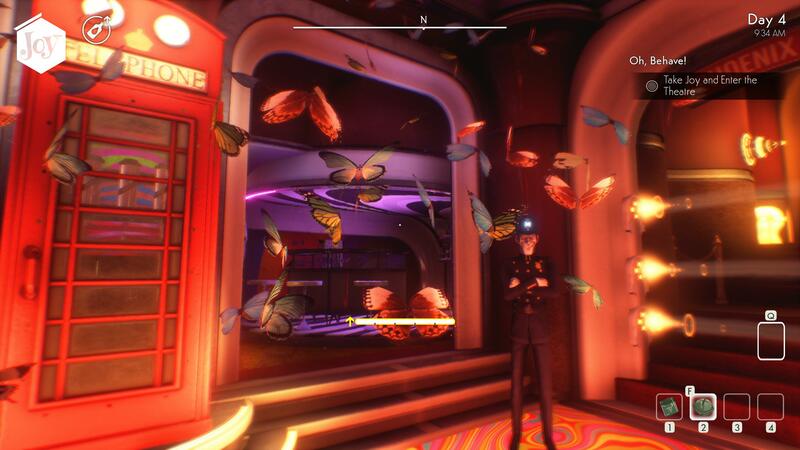 In contrast, the lack of this refinement really sticks out in We Happy Few, frustrating the experience with tiny details that don’t allow things to just flow. I can’t think of a better example of this than the difficulty in closing doors. When sneaking your way about a level, and then seeing your chance – a gap in the flow of the guards, darting through a doorway – the denouement of any such moment is the closing of the door. There’s the slow build up, the sudden adrenaline rush of the dash, and then the slumping relaxation of knowing you’ve found safety. Except here, that moment is inevitably spent trying to work out where the hell the game wants you to stand, and to look, in order to not select the mouldy carrot on the table to your far right, but the bloody door you’re staring directly at but for no discernible reason can’t close. Not only does it mean you might unfairly fail at any time, but it spoils the moments, again and again. Such issues with interaction are sadly universal – the game incessantly deciding I want to select the desk I’ve already searched and found to be empty, and not the object on top of it I want to pick up. It makes me realise how hard a Dishonored or the like must have worked to never let this be a thing that crosses my mind. It’s also just incredibly annoying. The problem is, it’s replete with issues. Daytime rolls in like a car crash, NPCs teleport about the place, combat is clumsy and sluggish and poorly communicated, crafting is convoluted and dull, cutscenes interrupt with such frequency that I began exasperatedly throwing my arms in the air when I just wanted to play, and just about nothing about the game is meaningfully explained. Which is a long list of complaints, for something that looks like it should be so good! It really does look spectacular, an aesthetic that feels midway between Dishonored and No One Lives Forever, by way of Aardman. It does bucolic British countryside beautifully. Quaint little ruining villages, iconic phone boxes and litter bins, all in a gently twisted style, along with the deeply creepy white-masked humans whose spindly, gaunt forms stalk its lands. 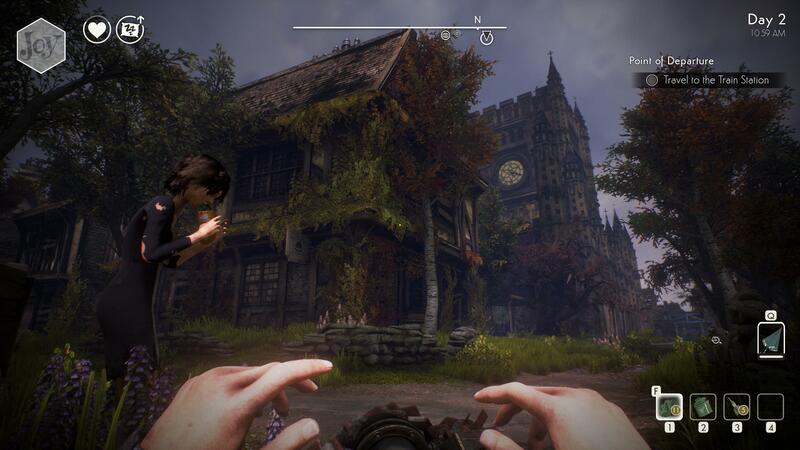 Really, the game looks like someone thought, “Hey, let’s do Sir You Are Being Hunted, but better”, and then didn’t. What they’ve created instead is a game that just absolutely undeniably feels like it should be being amazing all the time, and almost never is. It’s the oddest sensation. It’s like someone made a meal of all your favourite ingredients, and presented it beautifully, but just cooked everything slightly wrong. Underboiled potatoes, over-steamed beans, and is this chicken slightly pink in the middle? 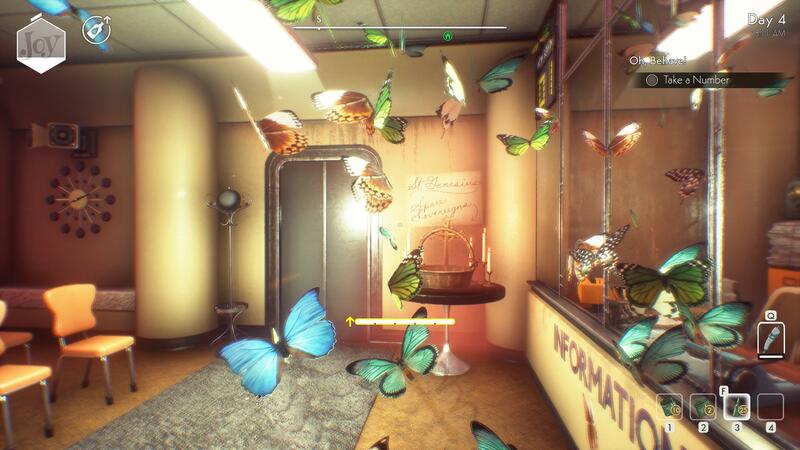 Confused why I’m not saying what We Happy Few is about? Because I wanted to recreate another real oddity of this game. This is how it feels to play, too. You begin in an office of an Orwellian company, clearly in some other post-war timeline, where your job is to redact anything from the press that might be negative about the government, or indeed be negative at all. There’s something about a drug called Joy, and right near the start your perception of a cheerful office room breaks down and reveals miserable greyed tones and brokenness, and you’re offered the choice between “remember” and “take Joy”. It’s a choice for which you have no context, and since “remember” implies story to me, I picked that. From that point on, I saw other people taking Joy, was repeatedly berated for not having taken any myself, and wondered if I’d just made an enormous decision with far reaching consequences over the rest of the game. I carried on wondering that for hours, so completely unclear was it about what was going on. Because moments later, you’re no longer working at this company, but now seemingly living on the streets, trying to survive amongst others rejected by society, with some elusive goals regarding a kidnapping by the Germans. Did Germany win the war? What caused this societal split? Who and why and where and what? Oh, now I’m in a new location. Huh, that’s happened again, and all my stuff’s been taken and not given back. At some point the game’s endemic ambiguity – ever contradicted by NPCs who speak to my character as if he understands everything – made me think I must have missed an opening cutscene or something. I started again, just in case. It turns out, the more you play, the more back story gets filled in, but not in a clever way – just a jumbled confusion, albeit one that suggests an intriguing direction. In fact, it leaps about so often that the sense that I wasn’t getting to see vital cutscenes persisted throughout. I’m not missing them – it’s just a mad jumble that woefully lacks cohesion as the plot jumps all over the place. The story goes on to be about the search for your little brother, which in turn leads you through a series of heavily over-scripted sequences that just don’t make sense one after the other. Near the start there’s some absolutely exquisite environmental storytelling regarding how the children came to go missing, but this soon gets pushed aside for the far more heavy-handed insanity of its obsessive expositional cutscenes. The writing is often really good, and the acting matches, along with some splendid character design. But the sum of it all is much less than that of its parts, as it tries to cram in dystopian theme after theme in a mad muddle. 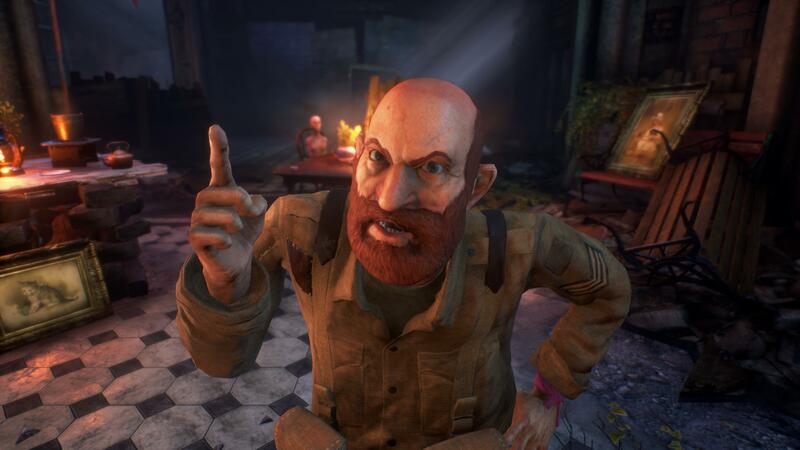 In the end though, We Happy Few fails because its stealth fails and its combat fails. As I said at the start, this game’s main function is to demonstrate just how stunning the stealth in Thief, BioShock, Dishonored, etc. really is. Because here getting caught feels utterly random, and the consequences are catastrophic. There’s no quicksave, so instead you’re reliant on checkpointing. But it’s atrocious, oftentimes dumping you back in your safehouse miles from the mission you just randomly failed at, making the process grim indeed. Fighting is first-person melee, an approach that almost always fails in gaming, and this certainly follows the pattern. The dull hit-or-block approach is made worse by the daft juggle of controls to try to get a weapon in hand, by which point the haphazard damage modelling might mean you’re all but dead after a single hit. Or indeed the enemies might start spinning on the spot, walking away from where you’re stood in the open, calling out to try to find you. As much as the game may have these weirdly intangible failings of ambience and flow, it’s really these two issues that do it for me. 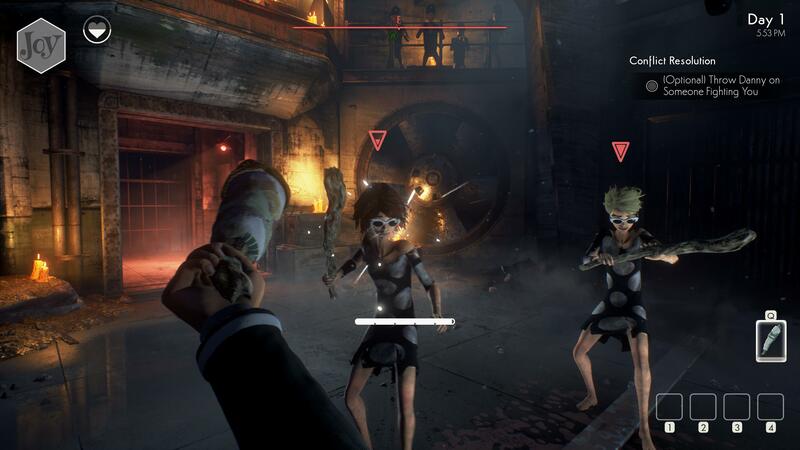 I’ve not gotten an enormous way through We Happy Few, because I’ve severely disliked the hours I’ve sunk into it. I think it’s probably, really, just a mediocre game, but it’s one that’s made me feel drained and discombobulated with its incoherence and that deeply peculiar atmosphere of feeling like it should be a great game, while never actually being one.